All VTO Wheels are constructed from our own proprietary molds from A356 virgin aluminum alloy. After casting all wheels are heat treated to a T6 condition. After casting and heat treating, the wheels are electrostatically powder coated, machined and a final clear coat applied to the entire wheel. Every VTO Wheel is identified with VTO on the front side of the wheel. 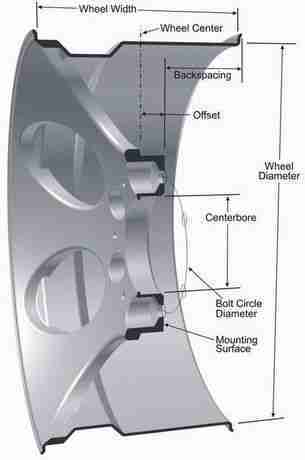 Below is a simple illustration of a wheel with the typical terminology to describe the associated dimension. Our fitment information for unmodified cars takes into account the correct dimensional information. This illustration is provided for informational purposes and can be used to help communicate dimensional information when trying to fit an unlisted or modified vehicle. There seems to be conversation from time to time as to whether having steel inserts in a aluminum wheel is advantageous. When we started importing Superlite wheels in 2002, Performance industries made steel inserts a standard. The test they conducted indicated that steel inserts were an advantage, especially when the wheels are taken off a car on a frequent basis. “Bolt Load Retention (BLR) is the amount of load (actually it is the tensile force in the male threaded fastener retained in a clamped joint after some duration. Typically it is expressed as a percentage of the initial fastener preload, i.e. 75% BLR means that the joint has relaxed enough to reduce the tension in the male threaded fastener to 75% of its original value. Aluminum and magnesium are prone to reductions in BLR due to a combination of factors (creep, stiffness characteristics of the joint, etc. ), especially if the service environment is characterized by variable amplitude loading and temperature fluctuations. The purpose of re-torquing wheel bolts is to keep the tensile force on the bolt as close to the specified level as possible, thereby maintaining the original clamping force on the joint. I have noticed that I have always just double checked the torque on new wheels several times at first and just never paid any attention to the fact that they required a bit more attention when new. I suppose there is always a bit of ‘bedding in’ with anything like this when new. On the same theme—Aluminum wheels with steel inserts for tapered lug nuts don’t seem to suffer from this phenomenon. I prefer tapered nuts and steel inserts but that is not available in all wheels. In more simple terms, We look at a wheel lug nut on a aluminum wheel in the same way you would any other nut on a stud in any application. The reason a flat washer is used to spread the load of the nut over a larger area. The same applies on an steel insert in an aluminum wheel.